Central and Clock tower go hand in hand in Thimphu, Gakyil is situated next to the iconic Clock Tower in the center of Thimphu. Right on the main road, with the Changlimithang stadium and archery grounds behind it, boasting 40 deluxe rooms with modern amenities and bathroom fittings. 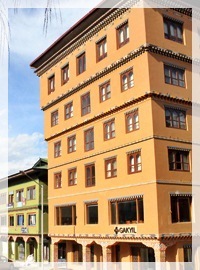 Gakyil is the place if you want to be in the heart of Thimphu. “Would suggest Gakyil highly” A nice hotel located in the heart of the city. Good connectivity, good location, nice layout, affordable rates & very professional. Copyright © 2018 GAKYIL Bhutan. All right reserved.